Thanks for notifying us about that typo, corrected in the writeup..
Nice coverage of touch as per the man pages, but I think the article would be more useful if you cover the scenarios to use touch. In which scenario one would like to use the following options. If you modify the file then modify time changes. How come ls -l gives the access time? Did you check it? Doesn’t it only list the modify time. If you use touch -a then the output of ls -l doesn’t change, however try it with touch -m to notice the output. This may be behavior specific to the Apple/Mac implementation of TOUCH, but I figured one additional thing out. The touch command does not have an option to update the CREATION date of a file. However, if you use touch to update the modification date, and that date is before/earlier than the creation date, the creation date will be updated as well. Should it not be: YYMMDDHH ? mean the DAY doesn’t make sense. The info (MAN) page for “touch” says “-t [[CC]YY]MMDDHHMM[.SS]”. “touch -c -t 15062500 my-file.txt”. That’s June 25, 2015, 00h(00). 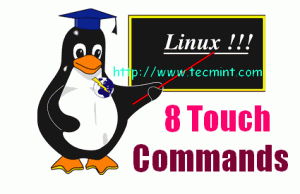 The basics of the command “touch” are covered very well, in a simple manner. Nice tutorials…covers basics of ‘touch’ fair enough !! Then the file icon i filer have a clock on it why? Out of curiosity, any idea how the touch command got its name? I think the idea is that you are just “touching” the file so it records that it was accessed/modified, but you are not actually changing the file in any other way. Note that there are no options to modify the content of the file itself. Yes, you correct and I totally agree with your point, we are only touching the file, no modifications, but it records as accessed/modified time. How does one update the modification timestamp of a file to become its current value plus one second? I would like to write a shell script which does this easily to any group of files as needed. Nice post & it’s very useful. One small correction here. I think the following command will update the time-stamp of file meena with the time-stamp of leena file.